Everyone waited expectantly for the Pope to speak, his word being the final in the series of speeches at Watani’s Jubilee celebration. 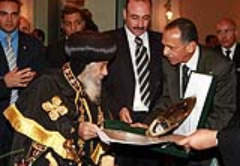 Pope Shenouda III lived up to his reputation; his famed wisdom and sense of humour enraptured the audience and drew cheerful laughter and wide applause. He praised Watani as a successful newspaper that, against all odds, managed to survive and thrive for 50 full years, a feat which places it among a few suchlike on the Egyptian press field. His Holiness expressed admiration of the wide and objective coverage of women’s issues in Watani and remarked that the paper’s female journalists outnumbered their male counterparts. He said he appreciated the fact that Watani printed a special corner for children. Watani managing editor Safwat Abdel-Halim warmly welcomed Pope Shenouda III, noting His Holiness’ wide culture and typically Egyptian sense of humour. Samia Sidhom spoke of Watani International. Very softly, she divulged her experience as head of the eight-year-old English supplement which she described as her baby, and how it relied and still relies on the fifty-year-old Arabic language Watani . Ms Sidhom reminded of how Watani International was born in response to the pressing demand of expatriate Copts whose children and grandchildren knew no Arabic. The idea was to help them connect with their roots, and it was their request to keep them posted on what was currently going on in Egypt rather than to focus on history or civilisation, information on what was easily accessible on the Internet for instance. Hence the diversity that runs through our pages, she said. Part of the material comes from our editors abroad, so that the English supplement would act as a two-way street carrying perspectives from and to expatriate Egyptians. Laura Hakim , managing editor of Watani Francophone, said that it was her dream to join Watani since as far back as she could remember, yet it was only when she married Victor Salama that she found herself there; hitherto she had been a teacher. Ms Hakim talked of how much Watani Francophone meant to her, and the encouragement she received from Mr Sidhom. She stressed the humanitarian side of the editor-in-chief and his protective feelings towards all who work in the paper. When her son Michael, a young reporter in the paper, had to travel to Zagazig to cover an assignment which dragged on till he realised he’d be behind schedule, he phoned the editor to apologise for the delay and promise to nevertheless hand the assignment on time. But Mr Sidhom, Ms Hakim said, wasted no time in stressing: “Just come back safely; the assignment will be managed anyway,” he said.